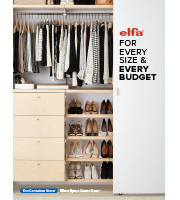 Give yourself a place to store and sort laundry in your closet or laundry room with our Elfa Divided Hamper. Available only at The Container Store, it secures to an Elfa Hanging Drawer Frame (sold separately) with the included fittings. It's easy to remove and features handles for transport. An insert in the base prevents sagging, and you can add a Hamper Cover (sold separately) to hide the contents. Natural Elfa Divided Hamper is rated 4.3 out of 5 by 10. Rated 5 out of 5 by AnnMarieP from Sturdy, collapsible laundry bag I don't have an ELFA closet system, but purchased this item (at a fabulously inexpensive price) to carry my folded laundry home from the laundromat. The hamper comes with two heavy duty pieces of plastic to put in the bottom of each section to help it stand up. Put both pieces in one section and the bag easily folds flat for storage. A great bargain and helps with a mundane chore. Love it! Rated 2 out of 5 by reetot from Thought I’d like it, but didn’t These were on clearance for an amazing price and I was excited to score two. But once I installed them I realized a couple design flaws and, ultimately, returned them. The problem is two-fold: first, it doesn’t really hold much laundry, and second (more importantly) while its intended to be taken on/off for carrying loads, that’s completely impractical given the design. The 4 corners attach with plastic “grommets” that hook over a little rod, but you have to hook each corner independently and, once you hook 2 corners, it’s tight enough that the last 2 take some effort. I’m sure it would loosen up over time, but after doing it a couple times I realized I wouldn’t want to do that after every load and I’d not use it as intended. In all fairness, the salesperson at the store suggested I just use a regular elfa bin for laundry and I didn’t listen to him, but he was right and that’s exactly what I’m doing now! I use an extra deep bin which I remove and carry very easily back and forth to my machine. Rated 5 out of 5 by Bfig from Finally my clothes are off the floor I have been meaning to buy this for a while, in fact, every time I look at the pile of clothes at my beside! I got the drawer frame on sale, they are a bit pricey, and finally I got my clothes off the floor! I love Elfa! Rated 5 out of 5 by TimInVA from Buy this one Love the divided hamper. The bottom doesn't sag like the normal one. Rated 5 out of 5 by Augs from Perfect finishing touch Fits perfectly with the rest of the system. Like the integration. Rated 1 out of 5 by Wilbur8 from total garbage This is terrible, the design is flawed and it does not work. Constantly falls off the pullout unit, hits my feet constantly, its so bad I"m taking it back. Also, insanely overpriced considering it DOES NOT WORK. Just garbage. Can this be used as a stand-alone hamper? I realize this hamper is meant to be used in a shelving unit. But can it used as a stand-alone hamper? The features and price is great and I could get two so I could definitely have a three section that&rsquo;s perfect. This won't stand up on it's own unless it has clothes in it. It does come with heavy duty plastic for the bottom so it will sit flat. The plus side is that when not in use, it folds flat. I have to go out to do my laundry, so that feature is good for me. The canvas is a decent weight as well. I also purchased because the price was too good to pass up (if I didn't like it, it could be returned). I'm very pleased with my purchase and will use it tonight to carry home all of my folded laundry. How many 'runners' deep is the hamper? Can the cloth hamper be used with the walnut decor sliding frame? Photo attacked of the frame in question. Can the hamper be used in place of the metal basket I currently have? Our elfa Hamper is designed to be mounted on an elfa classic 2'/60cm Hanging Drawer Frame only. Can this hamper stand on its own? This hamper is designed to be used in combination with our Elfa Classic 2'/60cm Hanging Drawer Frame and is not self supporting. The hamper can be hung as shown only, due to the design of the frame and the shelf brackets it snaps into.